In Trump’s America, there’s an upside down of the way it was. The Oath Keepers say left-wing activists are the real domestic terrorists, and their members are now the self-proclaimed protectors of free speech. Infowars has started selling T-shirts claiming, “Conservatism is the New Counterculture.” And WorldNet Daily, a publication that once claimed eating soy made you gay, has a correspondent in the White House. Even Stormfront, once the web’s preeminent cauldron of racist sentiment, has been overtaken by The Daily Stormer, a scrappier, far more anti-Semitic website that month-after-month attracts more racists than Don Black’s antiquated corner of the web. It doesn’t take a long view of history to see that the United States under President Trump — from blue California to red Kentucky — is radically different than it was just months ago. Left is right. Top is bottom. The news is fake. And Trump tweeting “covfefe” in the middle of the night makes perfect sense. 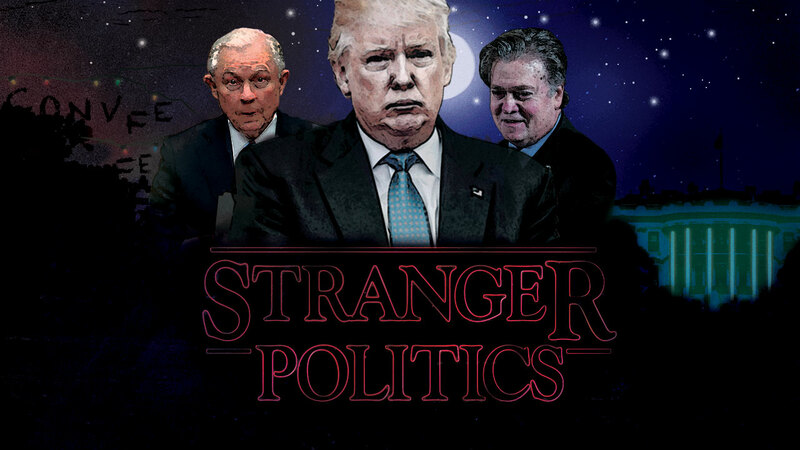 The term, popularized by the hit Netflix series Stranger Things, refers to an alternate reality where the world is an opposite version of itself, a dark mirrored take on things that for the kid sleuths who discover it, is haunted by monsters. It’s a “Freaky Friday” kind of politics — a reversal of the way things were that has seen ideas born on the radical right elevated into the mainstream along with a cast of characters who bring in tow ideologies that for decades had been relegated to the political margin. But this had been coming for some time. Even before Trump’s rise and the ascendancy of the Alt-Right, conspiracy theories and wild-eyed worries of “white genocide” that formed the backbone to an angry and violent radical right had been working their way into the mainstream. In recent decades, anti-immigrant worries have become the coin of the realm for many politicians — the same elected officials who fretted over United Nation’s Agenda 21, a non-binding resolution for sustainable, environmentally conscious growth, and are now falling in line with President Trump’s plans to build a wall on the country’s southern border with Mexico to keep out “rapists.” In fact, 16 years after the terrorist attacks on Sept. 11, 2001, the so-called “War on Terror” has become a worried rallying cry for those who see in Muslim immigration an invasion intent on destroying the West. Even though Spencer is no stranger to drunken pronouncements, his boast shouldn’t be dismissed. The movement of extremist ideas from the margins to the mainstream is at once a story told in real-time and one foretold by history. It is the story of an elevated and angry politics in the halls of power, and the strange reality that the ideologies of hate and extremism are the new normal.